Kiss My Smash: Oh You Fancy, Huh? Recently it was my turn to make dinner. GB requested grilled cheese and tomato soup. I decided to make it a fancy version. 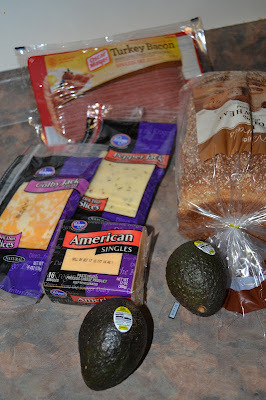 He still wanted some American cheese so in addition to that I added Pepper Jack and Colby Jack. I also decided to throw in some turkey bacon and avocado. I thought this would be the perfect time to bust out the George Foreman grill. I guess the assembly of the sandwich does not need much explanation. I made the tomato soup fancy by adding croutons. I would definitely recommend the fancy grill cheese to my readers. What would you add to make a fancy grilled cheese? GB wanted tomato too - I forgot it at the grocery store, ha! Thanks for stopping by Kiss My Smash!